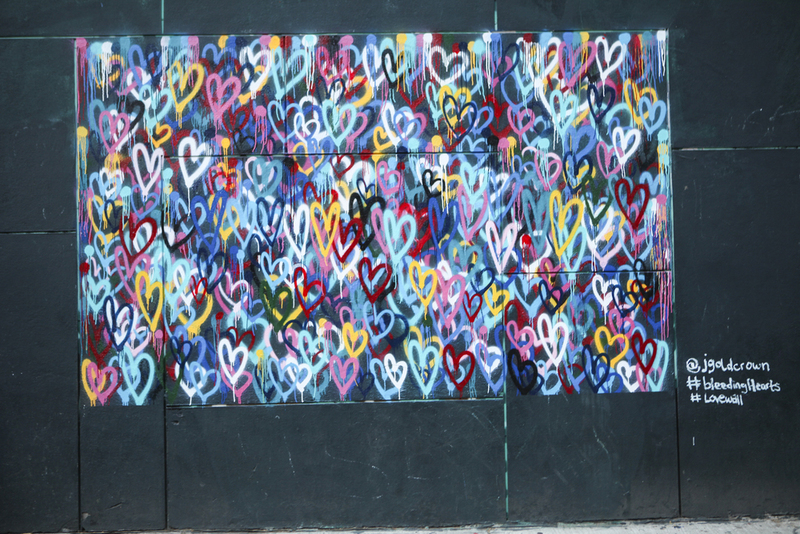 Summer, the best time to indulge in NYC's street art and ask your S.O. for a few snaps while you're there. Visiting the Bleeding Hearts mural by James Goldcrown has been on my list for the past three months (maybe more) but coordinating time with my boyfriend hasn't allowed for it until now. Once there I was quite surprised by the amount of foot traffic this tiny stretch of street gets. If you find yourself in Soho find it at the intersection of Broome & Mott Street. We were headed to a quick dinner at the Butcher's Daughter which gave me all the reason (and more) to dress up my Gentle Fawn striped dress. By dress up, I mean switch out my Adidas for these blue Joie heels. Both pairs have been getting so much wear this summer - it has actually been making my closet/shoe consolidation a lot easier. OH, and if you're into street art you should all follow Eva Chen's second Instagram account @PhotogenicWalls - it's seriously the best.